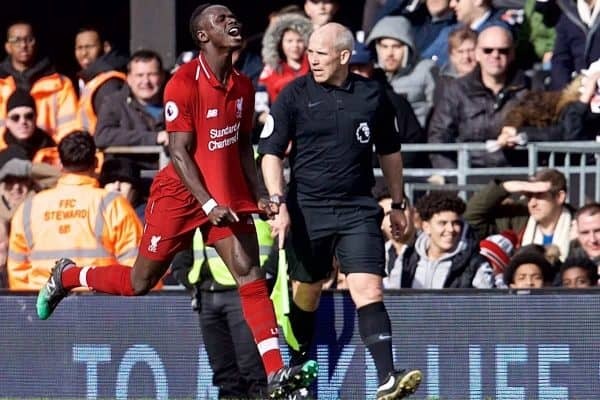 Liverpool returned to the Premier League summit after securing a thrilling 2-1 victory at Fulham on Sunday, leaving fans with a lot to discuss. History said a trip to Craven Cottage would not be smooth sailing and while the Reds made hard work of it, they returned to Merseyside with all three points and a place at the top of the Premier League table. Sadio Mane scored his 20th goal of the season to edge Liverpool ahead in what was a comfortable yet sloppy first half from Jurgen Klopp‘s men. 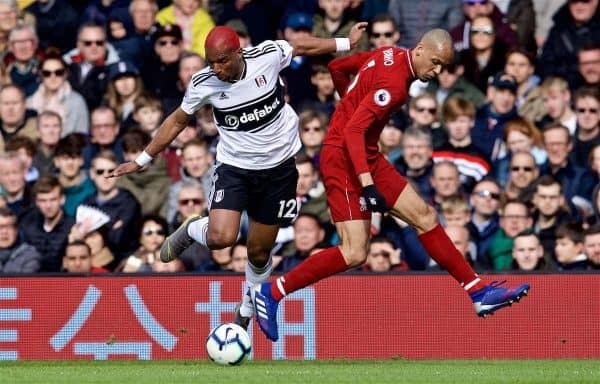 But the lack of conviction in the visitors’ play allowed Fulham to gain momentum as Ryan Babel capitalised on a rare error from Virgil van Dijk and Alisson to force the Reds to dig deep late on to secure all three points. 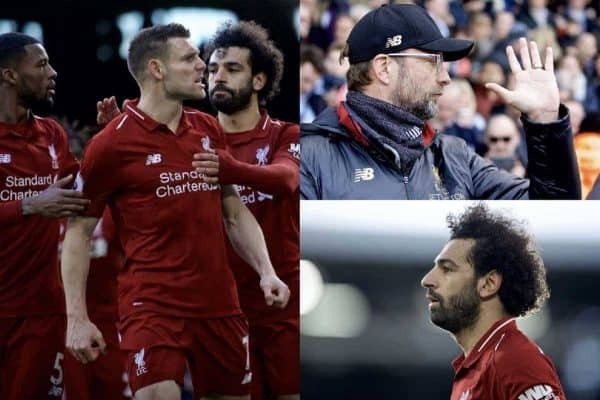 A spot-kick afforded Klopp’s charges the opportunity to restore the lead, to which James Milner duly obliged as his calm composure made certain that Liverpool left London with their 23rd league win of the campaign. This Is Anfield’s Joanna Durkan (@JoannaDurkan_) and Jack Lusby (@jacklusby_) were joined by Scott Stewart (@ImScottStewart) to delve into the highs and lows from the win and discuss whether a goalscoring milestone is weighing Mohamed Salah down. SCOTT: Mane deserves every bit of the lead-in here. Another Man of the Match performance from one of the most in-form attacking players on the planet. Once again, he terrorised a Fulham defence that held their ground well enough over the course of most of the match. 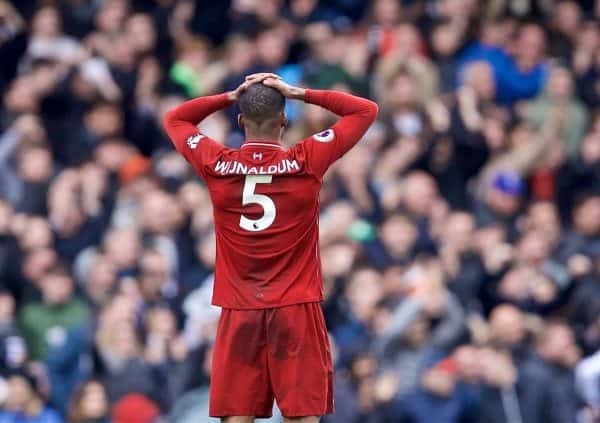 I was disappointed that the yellow for Fabinho stunted his aggression but Liverpool’s midfield came to show with both him and Wijnaldum having solid performances. Special shoutout to Matip as well, who had a good game. Good on Milner to recover well after his slice led to Fulham’s equaliser, another calm penalty sealing the Reds’ fate. JOANNA: Like Scott said, I don’t think you can start off without mentioning Mane and the superb form he is in right now. He’s consistently been the brightest spark in recent weeks, and against Fulham it was no different. The fact he’s scored just over half of Liverpool’s goals in the last 10 games—10 out of 19—just goes to show how imperative he has been to our recent run of results. Moreover, while the Reds were not at their best and their goal came as a result of our error, the fact that we still secured all three points, for me, proves that this title challenge is built on solid foundations. 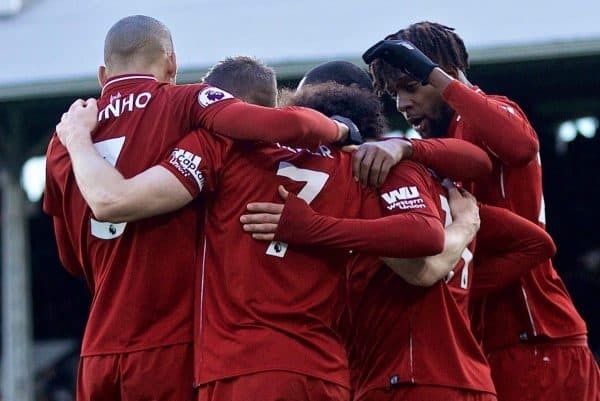 There’s a mental strength and level of calmness which the Reds possess, which they haven’t previously, and it got them out of a sticky situation—which will no doubt only add to the surging level of belief within the squad. Liverpool made it harder than it needed to be, but history says that’s nothing to be surprised about. The travelling Kop also deserves credit, they were fantastic throughout. JACK: Scott and Joanna have both covered the main positives, and Mane in particular who was clearly the standout, so I’ll focus elsewhere. Namely, the belief I had that despite going behind, Liverpool would still win the game. Babel scored with 16 minutes left to play, and there was no doubt in my mind that we’d be able to get back into it and take all three points. That’s a testament to the mentality within the squad this season, their proven ability to dig out results, and the way that has emanated from the manager and the players to the supporters. From doubters to believers indeed. SCOTT: Something is wrong with Salah—not from a chance creation perspective, or really even in his general play—in my opinion. He’s missing a spark and just seems to be a step behind mentally. He had a couple of half-chances but served as only a threat for the vast majority of the game. He might regret not setting up a few more chances. Outside of not finding the back of the net more than once from open play today, the only other downside came from the realisation that, sadly, Van Dijk is human. 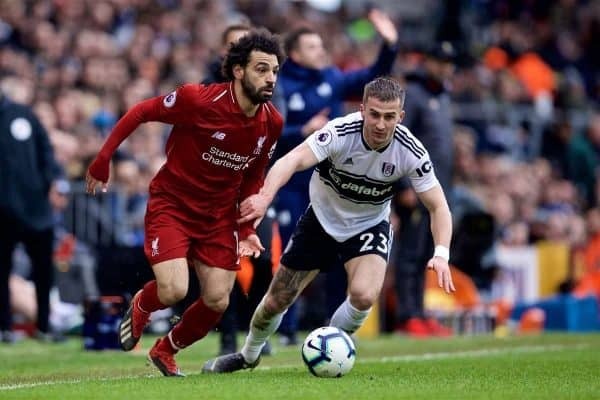 The soft header that led to Fulham’s goal could have been the final nail in Liverpool’s proverbial title coffin, but they proved their fight in the end. JOANNA: It allowed us to show the characteristics of a title-winning side, as I mentioned before, but Fulham should never have been allowed to even have a sniff of getting something out of the game. The efforts in midweek no doubt had something to do with it but the Reds were far too sloppy and lacked the conviction to to seal the game early on—a lesson in complacency when holding a slender lead. The blunder at the back is the obvious negative, but it was simply a one-off rather than a cause for concern. JACK: There were obvious negatives from that performance, and as Van Dijk himself said after the game, Liverpool made it difficult for themselves. I’m loath to suggest there was any complacency in taking on clear relegation favourites, and it was likely more due to the draining week that came before, but there was a lack of urgency in our approach. We had 16 shots on goal, which is only three fewer than in the 5-0 thrashing of Watford, but almost half of those were off target, and that obviously doesn’t take into account the spurned chances when it came to the final ball. I thought Trent had a difficult game up against a hungry Babel—and it was, in a warped sense, at least good to see him proving a point after a mixed time on Merseyside—and Robertson’s crossing was off at times. Obviously there’s the mixup at the back, too, but it was good to see both Van Dijk and Milner willing to take the blame in their post-match interview. And is Salah being hampered by his search for his 50th Premier League goal for Liverpool? SCOTT: I think, sadly, this is an easy yes. It’s not a giant record, but it shouldn’t have this much effect on his ability in front of goal. He’s still as much of a menace as ever but seven games without a goal in all competitions is an unexpected amount for a player of his quality. I’d venture to say most people did not expect him to take the penalty, but let’s end all speculation with a brace after the break, yeah Mo? Sound. JOANNA: It definitely feels that way. It’s all too familiar to that of last season when Salah was chasing down another goalscoring record and his decision-making let him down. It’s clear how desperate he is to score, and there is no problem with that, but it’s a weight on his shoulders which seems to make him overlook his team-mates in better positions. It in no way implies that he isn’t contributing, his tracking back to be the last line of defence as Fulham countered proves as much, but after five league games without a goal, and seven in all competitions, it’s clear it’s weighing on his mind. He’s in all the right places, but he needs to let his natural instincts take over and once he finds the back of the net he’ll finally find himself playing with more freedom. JACK: I’d love to be contrary here, but I do believe it’s playing on his mind. As Joanna notes, we saw this last season when he would go it alone or opt for the spectacular in his bid to break all-time records, and at times it came to the detriment of the side. Fortunately, Salah’s dry spell has coincided with an incredible run from Mane, and with 11 goals in 11 games that’s coming at the perfect time for us. 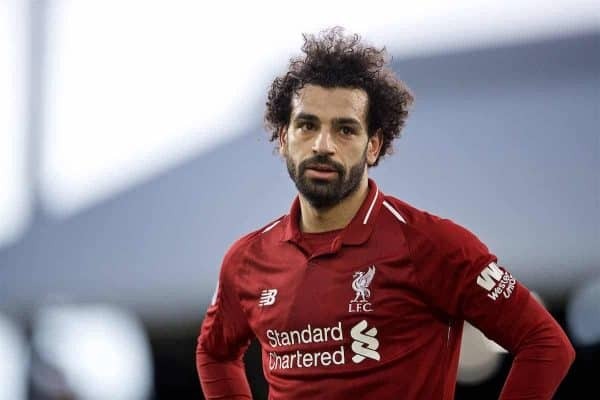 There’s no doubt Salah will turn this around, and it’s crucial to note he has been excellent in many games recently, but it seems to be a mental block he needs to get over.